We were wondering how exactly HP was going to handle the glut of TouchPads in the market now that they’ve decided they’re done making hardware for webOS. Now we have our answer: fire sale! The pricing may be set to go live tomorrow, but that hasn’t stopped some retailers. Best Buy Canada and Future Shop have already implemented the new pricing, and we expect others will follow through shortly. It seems HP’s finally looking to get those lofty unit sales numbers they wanted, though they can throw profit margin out the window. 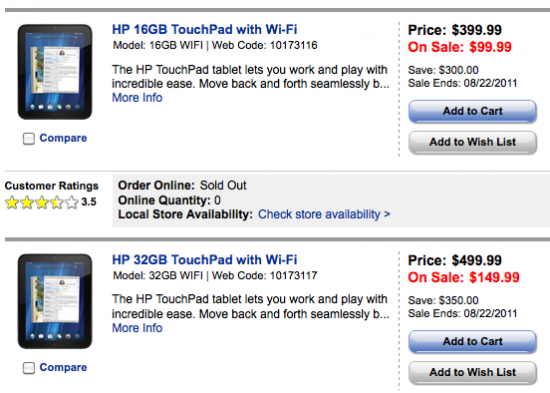 Unknown: if, when, or how much HP will cut the price of the sort-of-launched 64GB TouchPad. Source: Best Buy Canada, Future Shop; Thanks to Dan and Kyle for the tips!